My wife and I are on the tail end of a two-week stay in Brazil — my fourth time and her first. The occasion was the invitation for me to speak at a couple of conferences on the topic of evangelism. We’ve flown a lot of miles over this vast land, but have also driven a fair bit. Driving on Brazilian roads is full of surprises. Let me describe some of what we saw. To clarify, I was never the one driving. In most of the following, Rev. Ken Wieske was our chauffeur, a missionary with 17 years of driving experience on the streets of Brazil. We started our Brazilian adventure in the capital city, Brasília. The capital was designed from scratch and founded in 1960. It’s comparable to Canberra in Australia — another planned capital. This is the neatest and safest Brazilian city I’ve visited. Perhaps Brazil wants to make a good impression on the foreign diplomats who reside there. Traffic in this city is fairly tame, at least from what we witnessed. However, we did spot a motorcyclist laying on the road, having just been hit by a van. He appeared lifeless — was he merely unconscious or dead? We couldn’t stop and didn’t find out. As safe as Brasília is, there are areas in the metropolitan region that can be sketchy. On our way to and from a speaking engagement at the Reformed church there, we travelled through one such area. Like in other large Brazilian cities, at night you do not stop for red lights. If you stop for a red light after dark, you’re inviting trouble — perhaps a car-jacking, maybe a simple robbery at gunpoint, or worse. Our next stop was the city of Belém, way up north near the mouth of the Amazon River. Apart from some congestion, we didn’t witness anything out of the ordinary in this city. One thing that was extra-ordinary was the change in the weather from the first time that I visited in 2012. 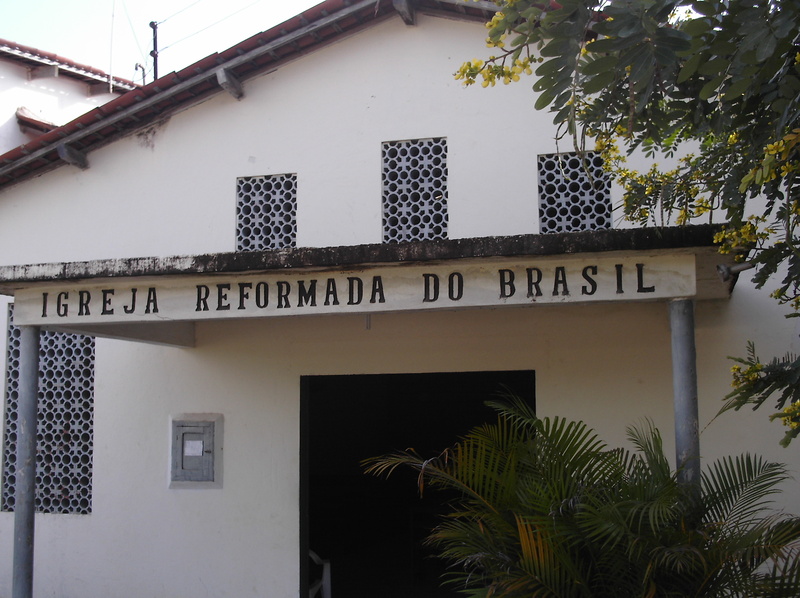 In 2012, I spoke at the Reformed Conference hosted by the Central Presbyterian Church of Pará. Then, five years ago, you could depend on the tropical rains to arrive every day at about the same time: 4:00 PM. People would even make social arrangements before or after “the rain.” Today I’m told that doesn’t happen anymore. When (or if) the rain comes, it comes after dark. I’m told that this is the result of deforestation in the Amazon rain forest. After enjoying the wonderful hospitality of the brethren in Belém, it was down south to Recife. We flew to the northeast of Brazil, and then drove down the coast. Along the way south to the beach town of Maragogi, we passed through a police checkpoint where drivers are often stopped for bribes. This time they had already nabbed some poor schmuck on a motorbike and so we got past. Maragogi was the location of the 26th annual Puritan Project Conference. As in Belém, I spoke here on the topic of evangelism, along with a bunch of other speakers. It was a super time of fellowship with old and new friends and also a great opportunity to foster the growth of the Reformed faith in this country — people had come to this event from almost every state in Brazil. There were even some attendees who’d flown in from Portugal. The drive home on Friday was, let’s say, interesting. The distance from Maragogi to Recife is approximately 133 km. Normally, it should take about 2.5 hours. We left Maragogi around 3:00, but didn’t arrive at our accommodations until past 10. The first three-quarters of the drive was smooth enough. But then about 40 km out of Recife we hit a massive traffic jam. It had been raining for about two days and some of the streets in Recife were flooded. This backed up traffic to about 40 km out of the city. We were trapped in the world’s largest parking lot. Escape options were few and questionable. Google Maps suggested alternative routes, but Google never tells you what those alternative roads are really like: are they dirt roads littered with flooded pot-holes or do they take you through a favela? We stayed on the main route. As we were moving slowly along, guys were on foot wandering amongst the cars, trucks, and buses, selling water and popcorn. We were behind a bus when we suddenly heard what sounded like a gunshot. I know what a gun sounds like and that was very similar. When it happened, the bus seemed suddenly to drive erratically. However, as it turned out, it wasn’t a gunshot, just somebody’s car back-firing and the bus just happened to be jockeying for a faster lane. Some time afterwards (was it an hour? Two? Time stood still), a fellow on a motorbike was weaving his way through the vehicles and bounced between the one Rose was travelling in and their neighbour. He just kept going. On our last Saturday, we attended a 40th wedding anniversary celebration for some Brazilian friends, Manoel and Telma Canuto. This was in Boa Viagem, a Recife neighbourhood. On our way there, we saw a bus stopped by the side of the road with several police cars parked around it. Three guys were up against the wall with their hands interlocked over their heads. In 2017 so far, there have been over two thousand (2000!) hold ups on Recife city buses. In the past week, there was a 24 hour period when there were 13 such incidents. It’s not unusual for shots to be fired in these incidents and for people to be injured or die. Life is cheap here. In this instance, the evildoers were somehow stopped and apprehended. The streets of Australia and Canada are incomparably safer — and for that we ought always to be thankful. However, streets all over the world have one thing in common. Wherever you go in the world, you see countless people on the streets and they’re all traveling somewhere. They’re also going somewhere in the spiritual sense. All are either on a broad road leading to destruction or on a narrow road leading to life. One road is congested and full of traffic, the other is comparatively less-traveled. Whether in Australia, Canada, Brazil (or wherever), we’re living on a mission field. Our calling is to be God’s instrument to direct traffic off the broad road and onto the narrow road. I’m glad that work continues to be done in Brazil and seeing it done here makes me even more intent on seeing it done where God has placed me too. This video features some of the men that I taught in Brazil. We spent a fair amount of time on the Van Til/Clark controversy. This video was something these guys just did on the fly in response. Very creative! The harvest is great, but the labourers are few. Rev. 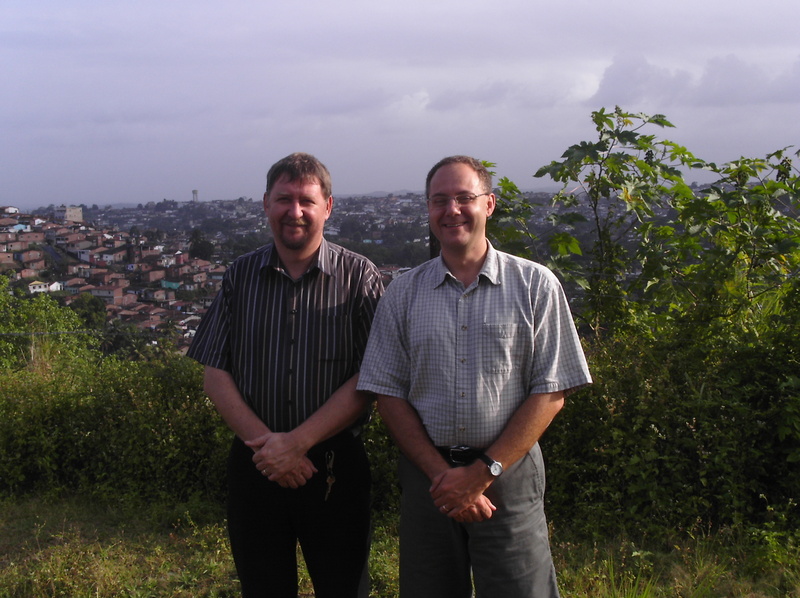 Ken Wieske is one of our three CanRC missionaries in Brazil. The other two: Rev. J. Van Spronsen (currently on furlough) and Rev. A. 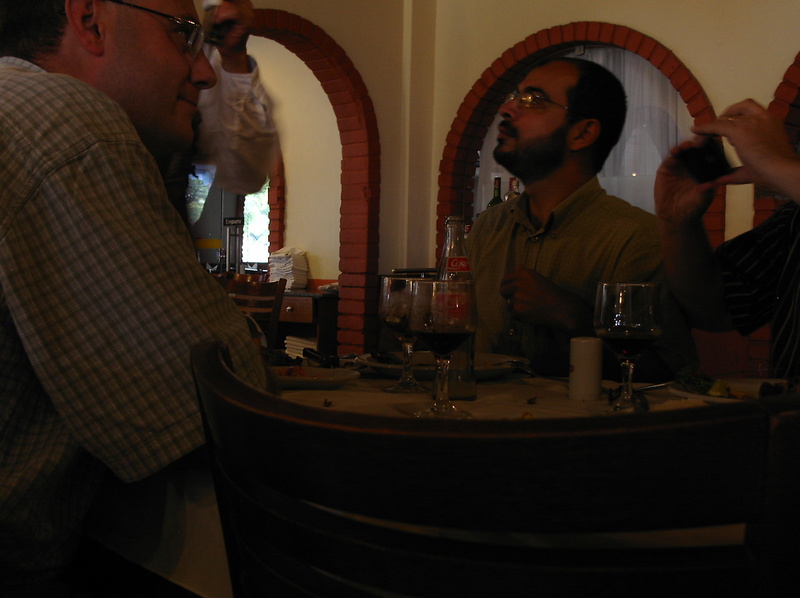 De Graaf (working in Maceio). There is a beautiful word in Greek to describe a special time: kairos. A kairos time is just the right moment, the moment of opportunity. As I finish my time here in Brazil, this is the word that captures my thoughts. When it comes to the gospel, when it comes to the Reformed faith, we are at a kairos time here. The doors are obviously opening all over the place. And as the economic circumstances of this country continue to improve, these doors will likely eventually close. History shows that mammon has a way of hardening people’s hearts to spiritual things. Let me give three examples of how this is obviously a kairos moment. You can learn a lot about an area and its spiritual direction by just going to a plain vanilla Christian bookstore. Last evening, Rev. Ken Wieske took me to just one such bookstore in downtown Recife. Yes, there was a lot of junk, the usual crud by Joyce Meyer, Philip Yancey, Max Lucado, and so on. But there was a whole wall of serious theological books. Among them I discovered: Thomas Watson, Francis Turretin, Cornelius Van Til, Charles Hodge, Louis Berkhof, and many other Reformed stalwarts. The commentary section included John Calvin and William Hendriksen/Simon Kistemaker. There were church history books by Frans Schalkwijk and Jean Crespin (one of the publishers of Guido de Bres). This was unbelievable. Try and find anything comparable in a similar bookstore in Canada. I repeat that this was not a Reformed bookstore. Moreover, the prices were outrageous. And yet people are eating this stuff up. This stuff is selling! There is a huge interest, not just in Recife, but all over Brazil, in serious Christian thinking from the Reformed heritage. Rev. Adriano Gama and me. 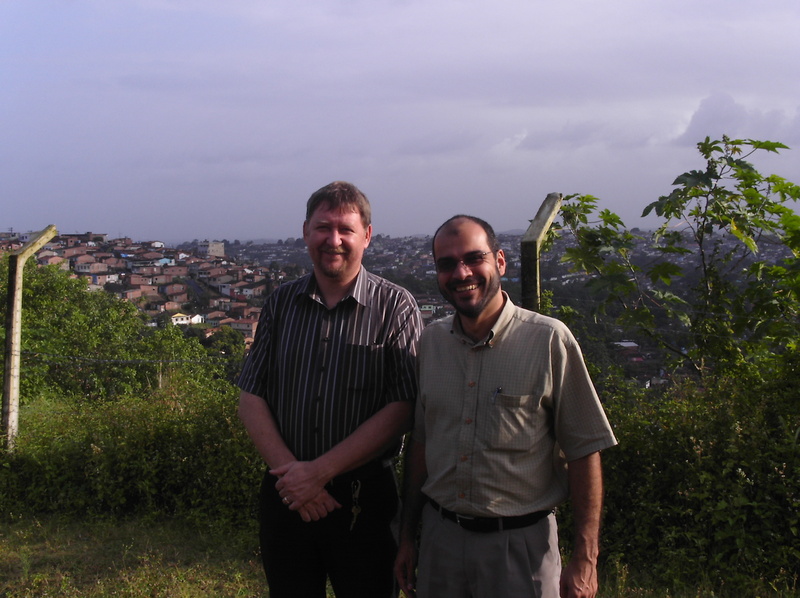 Adriano is a pastor in the IRB, a front-line soldier of the cross, and a long-lost twin brother. He regularly lectures at the Reformed Reading Room. This is reflected in my second example of what’s going on at the Reformed Reading Room. Every Monday evening, lectures are given by local Reformed pastors. I had the opportunity to be a guest speaker last Monday evening. I also taught the first apologetics course at the Reading Room last week. We had the opportunity to teach some 40 people. Many of these folks are not currently in a confessionally Reformed or Presbyterian church. But they are open to be taught. They are hungry to be taught. 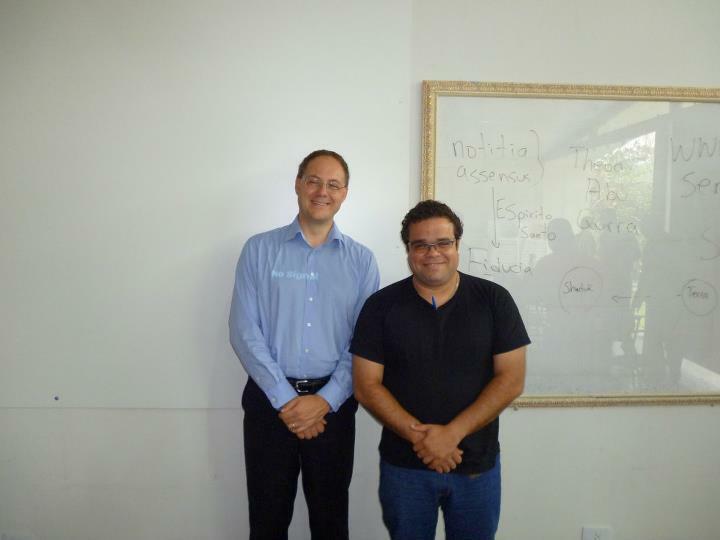 Madson Marinho was recently received as a new seminarian in the Reformed Churches. He has contacts all over Recife and brings in the crowds to the Reading Room. My third example is what is taking place here at the John Calvin Institute, the new seminary of the Reformed Churches of Brazil. This is the training school primarily for the Reformed Churches. Four men are being trained to become pastors. Another is scheduled to begin shortly. Yet the school is open to receiving students from other churches, whether for the whole programs or just for single courses. Again, there is a deep interest in what’s being done here. My apologetics courses, for instance, saw a number of men join us from diverse backgrounds. One was a Congregationalist, one was a Baptist, one was a Pentecostal, several were Presbyterians, and then we also had the seminarians. They came from all over and most of them have indicated their intention to come back for the next course. The John Calvin Institute has the potential to impact all of Brazil with its solid teaching and commitment to Reformed orthodoxy. 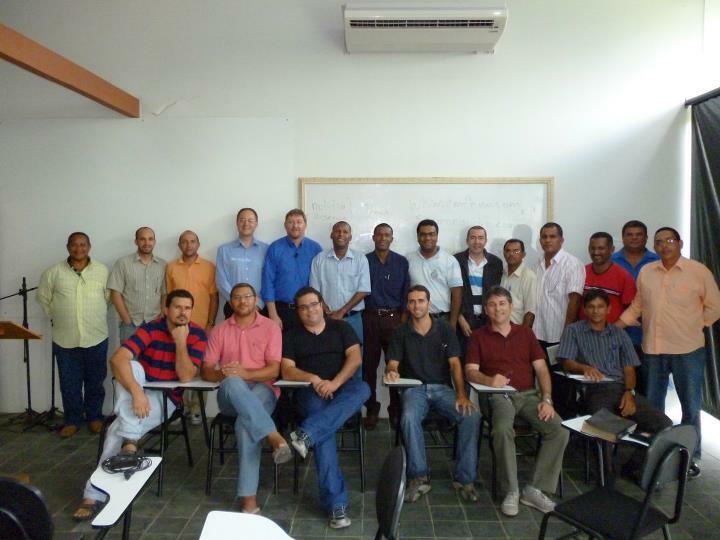 The apologetics class at the John Calvin Institute, along with me and my translator, Rev. Ken Wieske. The missionaries here are pumped about the situation. They want to take advantage of the time. They have been placed here “for such a time as this.” I was privileged to be able to come down and see it for myself and be involved in a small way. I’ll be heading home in a few hours, but this work will continue, and it will continue to occupy my prayers. I’ll be praying that our missionaries will have strength. I’ll be praying that our gracious Father will give the means to seize the day. Please join me in that prayer. Why? Because what is at stake here is not a little Reformed “empire,” but the glory of God. Because of its faithful and biblical understanding of the gospel, only the Reformed faith can advance the glory of God in the most maximal way. Some of the students at the Reformed Reading Room in Recife. The last few days have been a whirlwind. We’re now near the end of my time here. What’s been happening? Last Saturday, we concluded the apologetics course at the Reading Room. I was impressed that most of the people there on the Monday evening persevered all the way to the end. Much to be thankful for! Sunday saw us head down the coast. I preached in the Reformed congregations at Sao Jose da Coroa Grande and Maragogi. I was able to spend the afternoon with one of the local pastors, Rev. Alexandrino Araujo Moura. In the evening, we enjoyed the warm hospitality of Elder Moizes Lins. Moizes makes an awesome octopus dish! On Monday morning, our students arrived at the Calvin Institute for the first apologetics course. Most of them came from the state of Sergipe, some seven hours driving time from here. We began in earnest on Monday afternoon. On Monday evening, we took one more opportunity to give a lecture at the Reading Room. I spoke on the concept of self-deception in apologetics. There were about 30-40 people present for this, many of whom did not have a Reformed background. 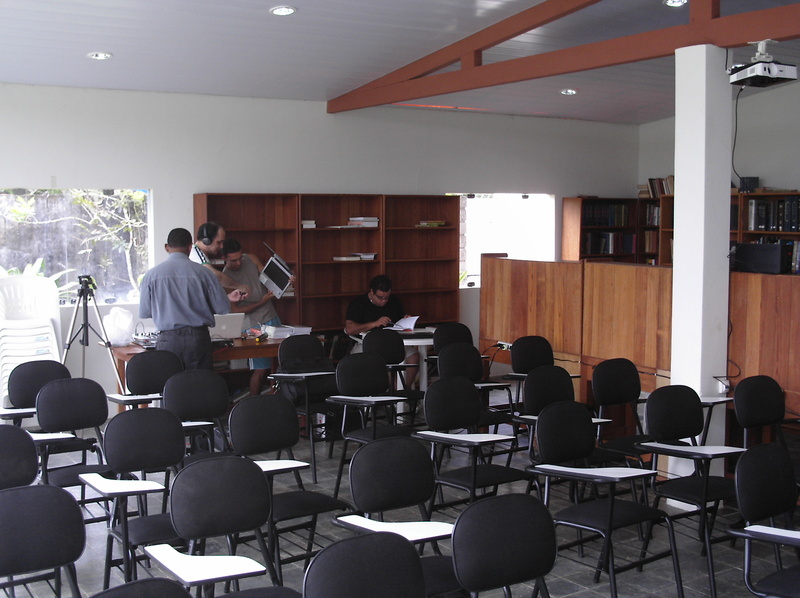 Getting set up in the classroom at the Reformed seminary in Aldeia. Yesterday (Tuesday) was spent mostly in the classroom at the seminary. In one day (! 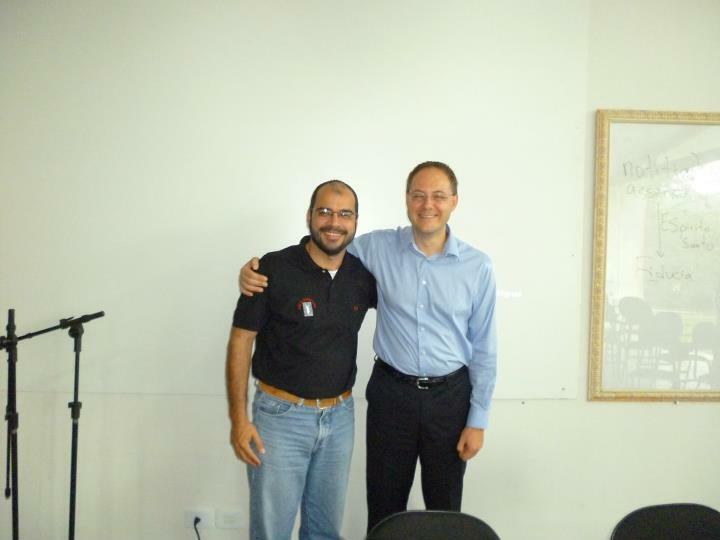 ), we finished the first introductory apologetics course. And today and tomorrow (Wednesday/Thursday), we’ll be doing the other course. This one deals directly with Cornelius Van Til. We hope to wrap things up tomorrow afternoon and then I head for home again on Friday morning. I simply taught, preached, and wrote God’s Word; otherwise I did nothing. And while I slept or drank Wittenberg beer with my friends Philip and Amsdorf, the Word so greatly weakened the papacy that no prince or emperor ever inflicted such losses upon it. I did nothing; the Word did everything. The other highlight from yesterday was the street preaching in Vera Cruz. This took place just down the street from where the church meets. In fact, if you want to see the location, just go to Google Maps and type in, “Vera Cruz, Aldeia, Pernambuco.” That ‘A’ you’ll see almost marks the exact location. So how did this street preaching work? One of the seminarians (also an elder in the church) took the microphone first (we had sound amplification). He introduced the church and told people where it was and when it worshipped and so on. Then Rev. Wieske came forward and he led in prayer. He read the Scripture passage that I was going to preach on (Matt. 5:21-22), and then I came forward. I preached for about 15 minutes or so. Rev. Wieske translated. Then he preached on John 3:14-16. I couldn’t understand much of it, but I did hear the Portuguese words for ‘sinners,’ ‘hell,’ ‘Saviour,’ and ‘gospel.’ I’m sure the Word of God was powerfully proclaimed. Those passing by heard clear and direct calls to faith and repentance. They heard the bad news that awaits sinners apart from Christ, but they also heard the good news of the way out through Christ. This was a busy street corner. By my estimation, a few hundred people passed by in the hour or so that we were there. Some of them stopped to listen for a few minutes. Afterwards, Rev. Wieske did some follow-up with one of those who had heard the gospel. This was a local shopkeeper, a man who also happens to be the landlord for the church. He was asked if he had heard the messages. He had. He was asked if he understood the message. He said that it was clear and he even went further: he said it was the truth. But when pressed further, he didn’t want to leave his sinful lifestyle. He was invited to church. He replied that he would be a hypocrite to come. Of course, he was invited again nonetheless. The man lives and works right next to the church. He can hear the preaching every Sunday morning and evening. Perhaps yet our Sovereign God will bring him to true faith in Christ. We’ll be praying for him!